Notch receptors are critical determinants of cell fate in a variety of organisms. Notch signaling is involved in the chondrogenic specification of neural crest cells. Aberrant Notch activity has been implicated in numerous human diseases including cancers; however its role in chondrogenic tumors has not been clarified. 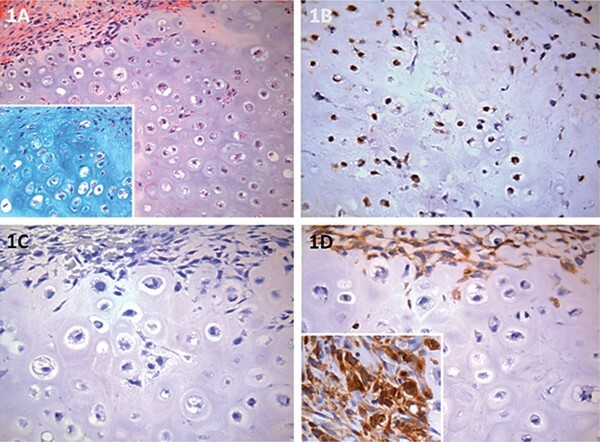 Tissue samples from a case of primary chondrosarcoma of the maxilla and its recurrent tumor were examined immunohistochemically for Notch1-4 and their ligands (Jagged1, Jagged2 and Delta1) expression. Both primary and recurrent tumors were histopathologically diagnosed as conventional hyaline chondrosarcoma (WHO Grade I). Hypercellular tumor areas strongly expressed Notch3 and Jagged1 in spindle and pleomorphic cells suggesting up-regulation of these protein molecules at sites of tumor proliferation. Expression patterns were distinct with some overlap. 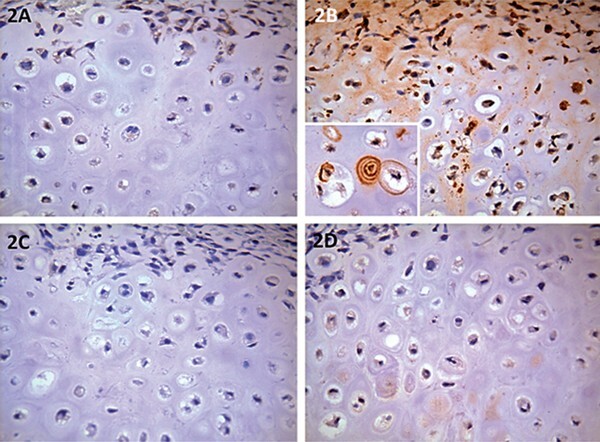 Differentiated malignant and atypical chondrocytes demonstrated variable expression levels of Jagged1, and weak to absent staining for Notch1, 4 and Delta1. Protein immunolocalization was largely membranous and cytoplasmic, sometimes outlining the lacunae of malignant chondrocytes. Hyaline cartilage demonstrated a diffuse or granular precipitation of Jagged1 suggesting presence of soluble Jagged1 activity at sites of abnormal chondrogenesis. No immunoreactivity for the other Notch members was observed. Calcified cartilage was consistently Notch-negative indicating down-regulation of Notch with cartilage maturation. Stromal components namely endothelial cells and fibroblasts variably expressed Notch1, 3 and Jagged1 but were mildly or non-reactive for the other members. Results indicate that Notch signaling pathway may participate in cellular differentiation and proliferation in chondrosarcoma. Findings implicate Notch3 and Jagged1 as key molecules that influence the differentiation and maturation of cells of chondrogenic lineage. Chondrosarcoma is a rare malignant mesenchymal tumour characterized histopathologically by the production of cartilaginous tissue and the absence of production of bone tissue by the tumour cells [1, 2]. It ranked as the second most common bone malignancy where it forms approximately 11% of all primary bone cancers [2, 3]. Chondrosarcoma mostly affects long bones especially the pelvis, femur and humerus. It is uncommon in the head and neck region where its frequency of occurrence ranges from 1-12% of all chondrosarcomas [3–7]. Of these, 10% occur in the jawbones [6, 7] and most of these arise in the maxilla with a predilection for the anterior maxillary region [3, 4]. Chondrosarcomas are sub-classified into the conventional (hyaline/myxoid), dedifferentiated, clear cell, and mesenchymal subtypes [3–5]. Conventional chondrosarcoma, the most common subtype, is composed of either hyaline cartilage, myxoid cartilage or a combination of both of these matrices. The hyaline subtype is characterized by hypercellular hyaline cartilage containing cytologically atypical chondrocytes within lacunae. In contrast, the atypical chondrocytes of the myxoid subtype do not reside in lacunae but instead are enmeshed in a flocculent myxoid matrix. The mesenchymal subtype is known to display a more anaplastic appearance. According to the World Health Organization (WHO) grading system, three categories of chondrosarcoma were identified: grade I (well differentiated), grade II (moderately differentiated) and grade III (poorly differentiated) [1, 2]. The biological behaviour of these tumors is characterized by progressive enlargement and subsequent compression or invasion of local structures such as cranial nerves. Complete surgical resection of these tumors is the most acceptable treatment of choice . Radiotherapy and chemotherapy as adjunctive or palliative therapy remain controversial. The conserved Notch signaling pathway regulates cell proliferation, differentiation, and cell fate in diverse tissues [8–11]. Mammalian Notch family comprises four receptors (Notch1, Notch2, Notch3 and Notch4) and five ligands (Jagged1, Jagged2 Delta1, Delta2, Delta3 and Delta4). Notch receptors are structurally homologous transmembrane proteins with distinct differences in their extracellular and intracellular domains (ICD). Jagged (Serrate) and Delta proteins are also structurally related Tran membrane proteins with multiple epidermal growth factor (EGF)-like repeats and DSL motif (D elta, S errate, L ag-2) in their extracellular domains [9–11]. Binding of Notch ligands to their receptors on neighboring cells induce proteolytic cleavages, releasing Notch ICD which translocates to the nucleus to interact with DNA-bound proteins. This in turn activates the transcription of selected target genes such as Hes1, Hes5, and Hes7 [8–11]. Dys-regulation of Notch signaling has been implicated in some genetic diseases and tumorigenesis [12, 13]. Aberrant Notch can act as either a tumor promoter or a suppressor depending on the cell type and context. Regarding odontogenic neoplasms, we have reviewed the immunohistochemical characteristics of neoplasms and their physiological counterparts with Notch signaling . In the manuscript, the data of published literatures suggested that Notch signaling plays some role in cytoplasmic differentiation or acquisition of tissue specific characteristics in neoplastic cells. It has been demonstrated that markers for Notch signaling are differentially expressed during cartilage development and there is evidence for their functional role during this process where Notch1 is purportedly a marker for chondrogenic progenitor cells [15, 16]. A search of the English language literature revealed that although aberrant Notch signaling has been detected in bone malignancies such as an osteosarcoma [17, 18] and odontogenic jaw tumors [19, 20], its activity in the chondrosarcoma has not been previously reported. The aim of this study was to investigate the potential role of Notch signaling during chondroid tumorigenesis by examining the immunolocalization pattern of Notch receptors and their ligands in a case of maxillary chondrosarcoma and its recurrent tumor. Formalin-fixed, paraffin-embedded tissue blocks of a case of primary chondrosarcoma and its recurrence were retrieved and new 5 μm thick sections were prepared for staining with hematoxylin-eosin, and for immunohistochemistry. Immunohistochemistry was performed against Notch1, Notch2, Notch3, Notch4, Jagged1, Jagged2 and Delta1 according to the Envision technique as previously described . Briefly, deparaffinized sections of 5 μm thickness were pretreated for antigen retrieval by microwaving (99°C) in 10 mM of citrate buffer (pH 6, 20 min). These sections were then immersed in 0.3% methanol containing 3% hydrogen peroxide for 20 min, to block endogenous peroxidase, and rinsed in 0.05 M Tris-buffered saline (TBS) (5 min, two times) before immersing in blocking solution (Dako Corporation, CA, USA) for 20 min at room temperature. Then the sections were incubated with the primary antibody against each of the Notch family members [mouse anti-human Notch1 monoclonal antibody (LSC16925), rabbit anti-human Notch2 polyclonal antibody (LS-B399), rabbit anti-human Notch3 polyclonal antibody (LS-B3399), rabbit anti-human Notch4 poly-clonal antibody (LS-C40785), LifeSpan Biosciences Inc, Seattle, WA, USA, 1:500 dilution] and ligands [rabbit anti-human Jagged1 polyclonal antibody (LSB2442) and rabbit anti-mouse Delta1 polyclonal antibody (LS-B72), LifeSpan Biosciences Inc, Seattle, WA, USA, 1:500 dilution], [rabbit anti-human Jagged2 poly-clonal antibody (ab60041), Abcam Inc, Cambridge, MA, USA, 1:500 dilution], for 1 h at room temperature. Immunoreactions were performed using the Envision Kit (Dako Corporation, CA, USA). The antigenic sites were visualized using diaminobenzidine (DAB) substrate chromogen (Dako Corporation, CA, USA) and counterstained with Mayer's hematoxylin. For negative control, sections were treated as above but without the primary antibody. All the control sections were negative. Appropriate positive controls were also applied. Microscopic examination of the primary and recurrent chondrosarcomas revealed lesional tissues composed of hypercellular hyaline cartilage containing cytologically atypical chondrocytes within lacunae (Figure 1A). The histological diagnosis made was conventional or Grade I chondrosarcoma for both the primary and recurrent tumor. Photomicrographs of chondrosarcoma showing: A and Inset, lesional areas composed of hyaline cartilage with hypercellular zone at the periphery; B, Notch1 moderate expression in atypical chondrocytes; C, Notch2 was not detected; D and Inset, Notch3 strong expression in spindle and pleomorphic cells but absence of activity in atypical chondrocytes (original magnification, A-D, ×400; A, HE staining, A Inset, Alcian blue; B, anti-Notch1; C, anti-Notch2; D and Inset, anti-Notch3). In the hypercellular tumor areas, spindle-shaped and pleomorphic cells strongly expressed Notch3 (Figure 1D) and Jagged1 (Figure 2B) but were weakly positive for Notch1, Notch4 (Figure 2A) and weak to non-reactive for Delta1 (Figure 2D). Notch2 (Figure 1C) and Jagged2 (Figure 2C) were not detected. Photomicrographs of chondrosarcoma showing: A, Notch4 weak expression in pleomorphic cells and atypical chondro cytes; B, and Inset, Jagged1 strong expression in pleomorphic cells, moderate to weak in atypical chondrocytes; diffuse positivity of chondroid matrix. Note concentric spiral protein deposition; C, Jagged2 was not detected; and D, Delta1 weak to absent expression in spindle and pleomorphic cells and atypical chondrocytes (original magnification, A-D, ×400; A, anti-Notch4; B and Inset, anti-Jagged1; C, anti-Jagged2; D, anti-Delta1). In the hyaline cartilage areas, the malignant and atypical chondrocytes stained heterogeneously for Jagged1 (Figure 2B), and to a lesser extent Notch1 (Figure 1B), Notch4 (Figure 2A) and Delta1 (Figure 2D). Protein immunolocalization was largely membranous and cytoplasmic, sometimes outlining the lacunae of chondrocytes. In addition Jagged1 was also detected as a diffuse or dotted positivity in the chondroid matrix. Occasional concentric spiral pattern of protein deposition was also observed (Figure 2B). No immunoreactivity for the other Notch members was observed. Calcified cartilage was consistently negative for both Notch receptors and ligands. Stromal components namely blood vessels and fibroblasts stained variously for Notch1, 3, Jagged1 but were non-reactive for Notch2, Jagged2 and Delta1. The primary chondrosarcoma tumor sample examined here was from a 58-year-old Malay female who had nasopharyngeal carcinoma treated by chemoradiotherapy about 10 years previously. The recurrent tumor that developed seven months later was also from the same patient. Both primary and recurrent tumors were histologically diagnosed as conventional chondrosarcoma (WHO Grade I). Although most chondrosarcomas arise de novo, they are common in patients with Ollier's disease, Maffucci syndrome, Paget's disease and osteochondroma [1, 2]. It is likely that the chondrosarcoma that developed in this patient is an outcome complication of her treatment. Positive immunolocalization of Notch receptor and ligand protein in the primary and recurrent chondrosarcomas investigated in this study suggests that Notch canonical pathway was activated during the development of this neoplasm. The expression patterns of the various Notch members were distinct with some overlap. Strong expression for Notch3 and Jagged1 in the spindle and pleomorphic cells located in the hypercellular areas of the tumor suggests that these are key molecules that influenced the cell stem-ness of the chondrogenic progenitor cells. Reduced expression levels of Jagged1, Notch1, Notch4 and Delta1 in atypical chondrocytes implies that chondrocyte differentiation is associated with downregulation of these molecules. It has been shown that Jagged1mediated Notch signaling in human bone marrow stem cells is necessary to initiate chondrogenesis but must be switched off for chondrogenesis to proceed . Similarly, in this study, we observed that Jagged1 was detected in the neoplastic chondroid matrix confirming that this molecule is also important as a mediator in Notch signaling during oncogenic chondrogenesis. In addition, as with others , this study too demonstrates that soluble Notch ligands can interact with membrane-bound Notch receptors to initiate proteolysis thus dispelling earlier views that Notch signaling necessitates interaction between membrane-bound Notch receptors and with membrane-bound ligands of adjacent cells. In summary, a case of primary chondrosarcoma of the maxilla and its subsequent recurrent tumor were examined for Notch signaling activity. The data from this case study indicated that this pathway most likely plays an active and differential role in the acquisition of tissue-specific characteristics in ythis malignant cartilaginous neoplasm. Current findings implicated Notch3 and Jagged1 as key molecules that influence cell fate decisions in tumoral cells of a chondrogenic lineage. This study was partially funded by the University of Malaya Research Grant (RG083/09HTM) and Grant-in-aid for Scientific Research (C) (20592349) from the Japan Society for the Promotion of Science.